Whether it’s instant ramen, selfie sticks or Walkmans, Japan provides innovative, aesthetically-pleasing solutions to everyday problems. But how do you stylishly transport groceries from the market to home, bottles of booze to a barbecue, clothes to the sento, or bento boxes to a picnic? Use a furoshiki (cloth wrap). Furoshiki are rectangular pieces of decorative fabric made from silk, cotton or synthetic fibers that have been used for wrapping goods in Japan for at least 1200 years, since the Nara Period. Until the onset of paper and plastic bags in the 1960s, they were an indispensable part of daily Japanese life. Furoshiki can be distinguished from their fraternal twin the tenugui—another colorfully-dyed and-patterned Japanese cloth—by the difference in use. While both may be used for wrapping, tenugui have typically been used for other instances, such as mopping sweaty brows, as washcloths, and as decorations. There are around 10 different sizes of furoshiki, each with different applications and a myriad of wrapping techniques. When it comes to wrapping common foods, 45 to 50 cm is recommended. Other uses fare better with larger sizes. For bento boxes, 68 to 70 cm is best, and 90 cm for wrapping a bottle of booze (larger perhaps if you are kind enough to be gifting a magnum of wine or an isshobin of sake). Initially, furoshiki were known as hirazutsumi (flat folded bundle) and were used for wrapping and storing gifts to the gods and the Imperial Family. Over time, they became cloths used by the nobility to transport personal belongings to take to steam baths. Furoshiki were used to wrap things like yukata, pumice and yuzu, and were often decorated with family crests to prevent awkward mix-ups. The Edo Period brought vast changes to Japanese lifestyle and an increase in the opportunities for people to wrap things—public bathing become common amongst ordinary people, travel became more popular, and enterprise grew and spread. With the increase in people traveling for work and pleasure, the need to wrap both wares and portable bento boxes grew. It was during this period that pleasure jaunts such as hanami (flower viewing), visiting theatres, and boating became popular, and textbooks from this era featured guides on how to prepare elegant leisure-driven bentos. 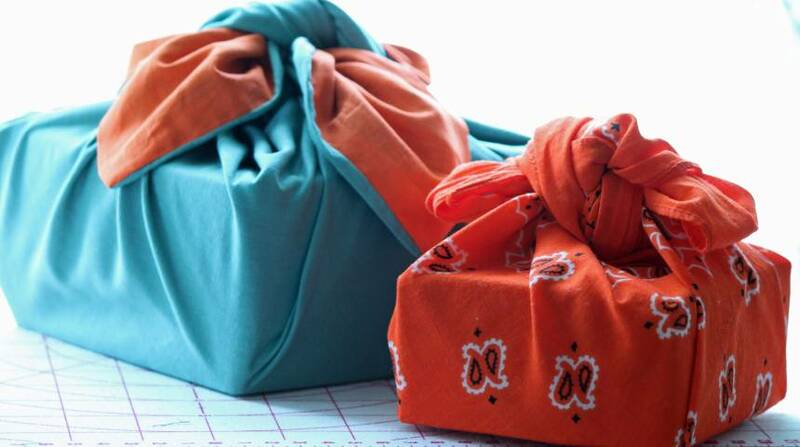 Furoshiki have the functional pros of making bento boxes easier to transport, holding them together and preventing mess, and can be transformed into a small tablecloth or napkin after unwrapping. For bottles, they insulate and prevent breakage. In addition to practicality, a furoshiki adds a layer of playfulness and visual stimulation common in Japanese product design. Japan is the most prolific gift-giving country in the world, and when a furoshiki is used for gift-wrapping, its role also goes beyond just functionality—it plays a part in conveying the message associated with the gift, and the status of a relationship. Intentions are silently expressed, codified in design and wrapping style. Some furoshiki do’s and don’t’s include: when bringing a gift to the parents of a fiance, furoshiki should not be tied; furoshiki with gaudy colors should be avoided for condolences; appropriate bright colors should be used for celebration. The Japanese culture of wrapping things—be it a bento box in a furoshiki, an onigiri in nori, or a woman in a kimono—is a way to cherish things and convey thoughtfulness and feeling. Though it has experienced a decline in use since the 1960s, furoshiki have made a recent comeback with environmentally-conscious people. In 2006 the then-Japanese Minister of the Environment, Yuriko Koike, presented a furoshiki made of fibre from recycled PET bottles to the Senior Officials Meeting on the 3R Initiative held in Tokyo. Exquisitely embellished with a bird and flower motif, the “mottainai furoshiki” was to bring attention to Japan’s culture of waste reduction. 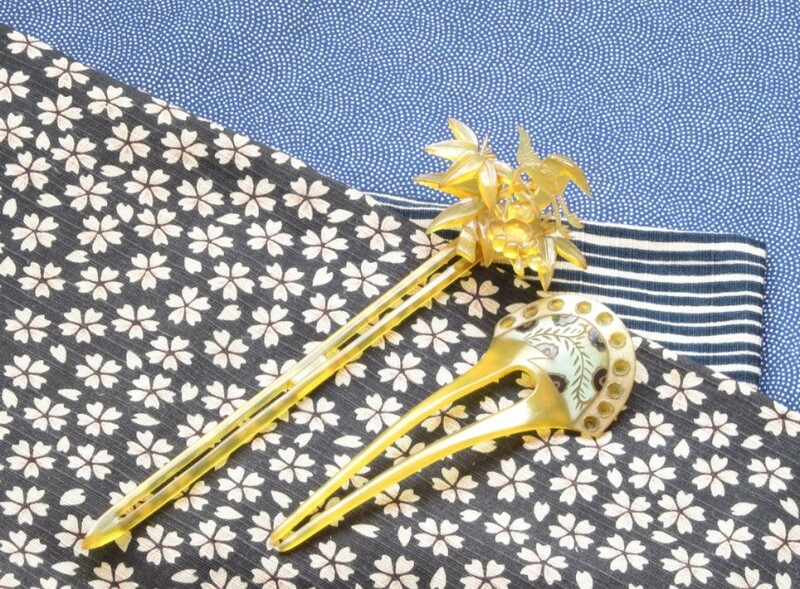 In addition to environmental concerns, this rise in demand is being driven by a renewed interest in traditional crafts by younger Japanese generations. Furoshiki are now available in a wide range of both traditional Japanese patterns and innovative modern and pop designs, spurring a new set of global fans, and making furoshiki an enduring testament to the possibilities of style and functionality.